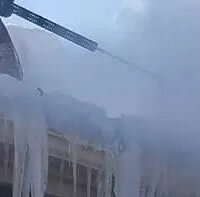 Best for small roofs and ice dams. Removal by steaming with a two-man crew. Hourly rate for 1 steamer with 2 men. Great for creating channels only and clearing gutters and downspouts (most jobs take only 3-4 hours, but will safe costly leaks inside! Price may vary depending on steep and height charge. Rates may vary during busy times of year. 3 Hour Minimum. Billed in 1/2 hour increments. After 6PM Daily, Weekends and Nights. Removal by steaming with a two-man crew. This is a Minimum Hourly Charge of 3 hour. Price may vary depending on height, steep factor and volume. Rates may vary during busy times of year. 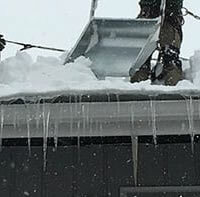 Best for large roofs and ice dam prevention. Roof Shoveling Only. Charge per hour with a two-man crew. Price may vary depending on height, steep factor and volume. Rates may vary during busy times of year. Billed in 1/2 hour increments. 3 hours minimum service call. 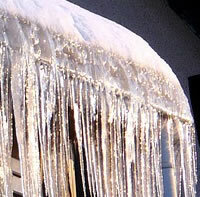 Not sure what ice dam package you need? Call us at (612) 251-6938.